Eighty percent of the world eats bugs. Four–fifths of the animal species on earth is insects, but insects one might eat that are highly nutritious are nearly impossible to find. Ironically, the FDA allows up to 50 or so insect parts per gram before it considers such staples as peanut butter, chocolate, or frozen vegetables “contaminated.” On a weight–by–weight basis that works out to a hell of a lot of insect parts we are already eating without knowing it. Your reaction to this factoid is either “yuck!” or “That’s interesting.” If the latter, then Dana Goodyear’s book is for you. 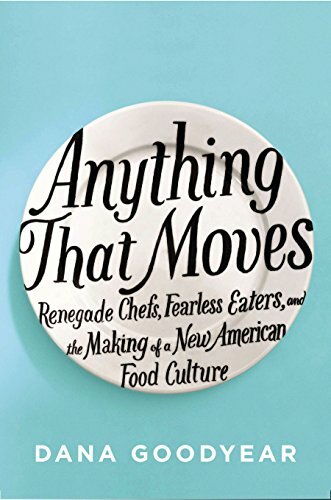 Ms. Goodyear, a staff writer at The New Yorker and a culinary picaro, delves into the recent explosion of foodie culture—a counterculture, really, whose impulse is to try the rarest, most offbeat, illegal, banned, forgotten, or shunned animal parts on the planet. “The deeper into the foodie world I ate, the more aware I became of its reactionary tilt,” she says. To acknowledge that food options have expanded, consider that twenty years ago people considered sushi yucky; now it is plentiful in ordinary supermarkets. Modern foodies question the narrow scope of Western diets focused on chicken-beef–pork. Their questioning has led to offbeat places that serve innards, extremities, bones, and beaks. “Jiggly–soft–unctuous” is how she describes offal—animal parts that include heart, lung, thymus, intestines, and God knows what else. Admirably, she hints at the craziness of our food attitudes when considered logically. We use insecticides to kill grasshoppers and locusts, for example, which contain complete proteins in order to grow the wheat, barley, and corn whose protein is nutritionally incomplete and must be supplemented from other sources. As deeply as Ms. Goodyear delves into the foodie movement, by page 80 the novelty of eating strange and slimy things begins to wear off. Without persuading us why we should care about people whose passion turns to rose–haired tarantula made into sushi Anything That Moves feels like a one-trick pony. She draws vivid images—“The whole room stank: warm, bilious, inescapably animal”—but her follow–through falls flat. The section devoted to Schedule I drugs as cuisine—pot, mushrooms, galangal, 420, hashish, Chinese herbs—is less than amusing, and the people promoting it come across as sophomoric. One maven, for example, praises a marijuana sample as having “a piney scent with hints of kumquat . . . I would compare the leaves to vetiver.” The exuberance rings hollow, illustrating rather how foodie movement comestables have increasingly come to be treated as controlled substances. While Ms. Goodyear is mostly evenhanded, her reportage at times feels one sided. The space she allots to raw milk enthusiasts with their “Raw Milk Heals” T–shirts, for example, glosses over the considerable health risks of microorganisms commonly found in unpasteurized milk. It is possible to get food borne illnesses from many different foods, but raw milk is perhaps the riskiest of all. The bacteria, viruses, and parasites contained in it cause diseases such as listeriosis, typhoid fever, tuberculosis, diphtheria, and brucellosis. Pregnant women in particular run a serious risk of listeria causing miscarriage or fetal death. Children, the elderly, and those with weakened immune systems are especially in jeopardy. In 2013, Alaska saw its second epidemic of campylobacter infection due to raw milk. Ms. Goodyear does nothing to counter the ill founded argument that pasteurization harms milk and that raw milk is a safe healthier alternative. Those who want beneficial probiotic bacteria are better advised to get them from fermented foods such as yogurt and kefir. The author ends with a scene of her eating balut, a Filipino tradition of swallowing a live duck embryo boiled alive and eaten in the shell. But like much of what goes before it, it proves hard to sustain her extreme subject. After a while everything tastes the same—just like chicken.